Maximum depth of 15m/50ft. Halocline depth 12m/40ft. 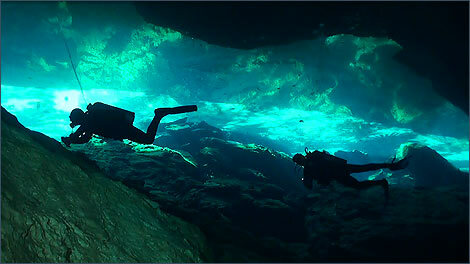 2 permanent gold lines lead into the Cavern from Chac Mool Main Entrance and end at Little Brother Cenote forming 2 completely different routes which both start and end in open water and can be dived from either Cenote and in either direction. Your guide will choose the best entry location and underwater route based the time of day to get the most of the available sunlight. The upstream Cavern Line leads the diver through a large well lit Cavern Zone with very impressive breakdown formations as large as a house and spectacular views of the jungle from underwater. You will see tree roots growing down into the water along the edge of Main Entrance and dive a hypnotic halocline passage towards Little Brother. In summer a green algae bloom 2m/6ft thick at the surface gives Main Entrance a very mysterious “other worldly” appearance. The downstream Cavern Line is darker but highly decorated with some very impressive stal and curtain formations. Halfway through the dive you can surface in a beautifully decorated air dome before continuing on through a forest of speleothems. Beautiful place to shoot but strong lights are needed. Beautiful if you have a wide angle lens to shoot the whole size of the cavern.